Britain has long been renowned for its acting talent both male and female. Throughout the decades the United Kingdom has been responsible for producing some of the finest theatre and film actors the world has born witness to on stage or on celluloid; here we look at some of them. Born Judith Olivia Dench on 9th December 1934, Dame Judi has become one of Britain's most well respected and well-loved actresses with an acting career that has spanned more than four decades. 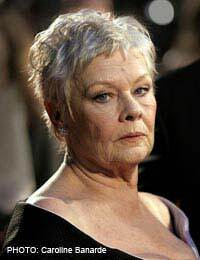 From her roles on television in such sitcoms as A Fine Romance (with her then husband Michael Williams) and As Time Goes By (with Geoffrey Palmer), Dame Judi has also had an illustrious theatre career as well as forays into the world of Hollywood. In 1995 she took over the role of M in the James Bond film Goldeneye (taking over the mantle from the late Bernard Lee) and bringing the franchise into the 90's and the early twenty-first century. Dame Judi is also known for her roles in period dramas including the portrayal of Queen Victoria in the film Mrs Brown which looked at the Queen's turbulent relationship with John Brown. Most recently Dame Judi has graced British television screens in the adaptations of Elisabeth Gaskell's Cranford novels. Born David John White on the 2nd of February 1940, David White later took on the stage name of David Jason before dipping his toe into the waters of the acting profession. In 1964 he took his first professional role in the long-running soap opera Crossroads before joining the trio of Michael Palin, Terry Jones and Eric Idle (who later went on to make up three of the three of the five Monty Python players) in the comedy sketch show Do Not Adjust Your Set. It wasn't however until the 1970's when Jason took on the roles of Blanco in Porridge alongside Ronnie Barker and Granville in Open All Hours (also playing opposite Ronnie Barker) that his career began to flourish. In 1981 Jason took on the role for which he is most famous in the United Kingdom - that of Derek 'Del Boy' Trotter, a fly-by-night market trader always on the look out for ways to make money. The show, Only Fools and Horses, ran for some twenty-two years, making it one of the most popular shows on British television. Jason also took on the role of Detective Inspector Jack Frost in the adaptations of R.D Wingfield's A Touch of Frost, a role which has endeared him to the British public even more. Julia Mary Walters was born on 22nd February 1950 and her first professional acting role was in Alan Bleasdale's Boys from the Blackstuff in 1982. She had her first film role in Willy Russell's Educating Rita (playing the part of Rita opposite Michael Caine) in 1983. She was nominated for an Academy ward (Oscar) and won a BAFTA for the role. Walters has also been a long-running player alongside Victoria Wood, comedienne, writer and songwriter who rose to stardom during the 1980's with her own brand of Northern humour. Walters was awarded the OBE in 1999 and the CBE in the 2008 Honours lists.